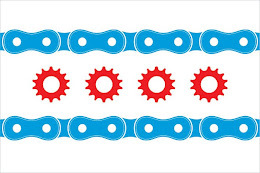 The summer weather invites droves of bicyclists to take to Illinois' streets and trails. With this increased usage in mind, Secretary of State Jesse White has recently emphasized the importance of wearing a helmet while bicycling. At the moment, Illinois has no state law mandating the use of helmets. However, there are a few cities in Illinois that have laws in place requiring the use of a helmet. For example, in the city of Chicago, messengers and delivery workers who travel on bike are required to wear helmets. Cities like Skokie and Barrington have helmet requirements for riders under a certain age. Laws attempting to institute a state mandate have been introduced in various cycles of the Illinois General Assembly and each have been defeated. The idea of a helmet mandate is a divisive issue and those in the cycling community are split. Those who oppose a helmet mandate do so on the principle of individual liberty, often citing the "Peltzman Effect" as justification for their opposition: using a helmet increases the cyclist's perceived safety thus increasing his/her tendency to partake in riskier than normal behavior. Those who support a helmet mandate cite the statistics compiled by the National High Traffic Safety Administration which states that helmets "are 85-88 percent effective in mitigating head and brain injuries" and that "nearly 70 percent of all fatal bicycle crashes involve head injuries." Our experience representing Illinois bicyclists injured in a bicycle accident has given the Illinois Bicycle Lawyers at Keating Law Offices a somewhat unique insight into the real world applications of a bicyclist's helmet, and the results of the absence of a helmet. As was previously discussed in a post on www.ILBicycleLaw.com, a concussion (a type of traumatic brain injury) is a probable injury for a bicyclist thrown from their bike in a bicycle accident. And with that possibility come some very serious implications for one's own mental and physical recovery. In the words of a neurosurgeon who testified at a deposition on behalf of a past client, "A concussion is a form of a traumatic brain injury. There is no such thing as a minor traumatic brain injury." Operating on that definition, we highly recommend Illinois bicyclists to choose to wear a helmet. Regardless of your stance on helmets, keep in mind the goal of helmets is to protect Illinois bicyclists' brains, not infringe on personal liberties. If you have any questions regarding this post or an issue involving Illinois personal injury law, please contact Illinois Bicycle Attorney Mike Keating at 312-208-7702 or MKeating@KeatingLegal.com 24 hours a day, 7 days a week. All emails and phone calls are returned promptly. All initial consultations are always confidential and free.